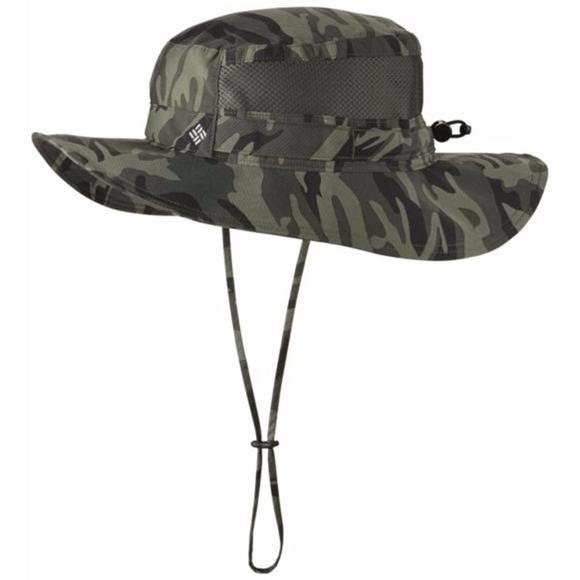 This high-performance Columbia Bora Bora Print Booney fishing hat battles the heat, combining sweat-wicking technology and a breeze-inducing mesh vent panel with a sun-cancelling UPF 50 fabric, which blocks out 98% of harmful UVA and UVB rays to keep you cool and protected during long hours on the water. This high-performance Columbia Bora Bora Print Booney fishing hat battles the heat, combining sweat-wicking technology and a breeze-inducing mesh vent panel with a sun-cancelling UPF 50 fabric, which blocks out 98% of harmful UVA and UVB rays to keep you cool and protected during long hours on the water. The Bora Bora Print Booney comes in a variety of camo-print earth tones, with an adjustable drawcord and a toggle at the back for the perfect secure fit.